Canna lilies are a spectacular, late summer flowering perennial, and a popular choice in northern Europe for those who wants to bring a taste of the exotic into the garden. Furthermore, if you are lucky with the weather then you can experience these gorgeous blooms right up to the beginning of December! Although Canna lilies originate in the tropics, some of the most ornamental cultivated varieties have been produced in cooler temperate regions, but in areas which receive freezing temperatures they are unlikely to survive and often treated as an annual. However in the warmer parts of northern Europe, such as the southwest coast of England, it is possible to leave your Cannas outside all year round so long as they are planted a little deeper than recommended and in a free draining soil. If your garden has heavier, poorer draining soils the consider planting canna lilies into raised beds. To reduce the penetration of ground frosts the apply a thick layer of dry mulch such as straw, bracken or bark chips. Be aware that successfully overwintered canna lilies will emerge much later than specimens lifted and brought in under protection. In fact you may not see your first leaves emerge until late June, or even early July! 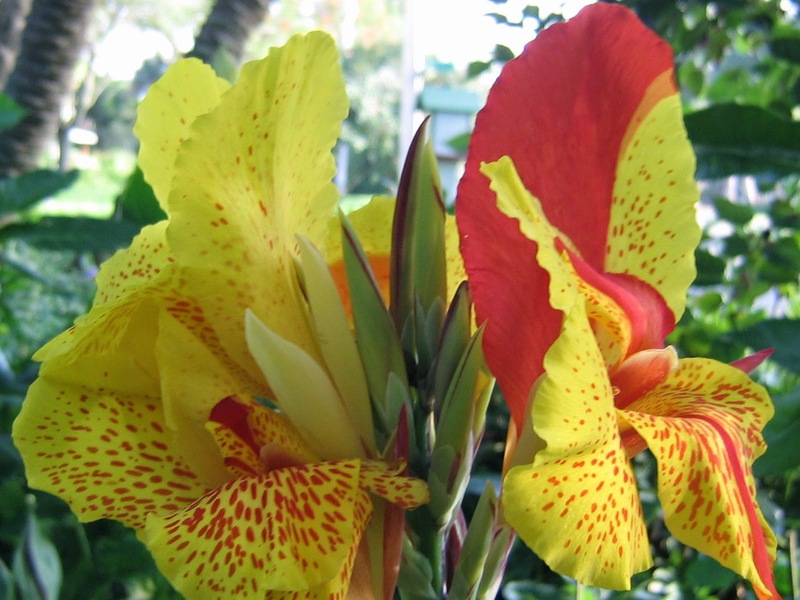 Canna lilies can be lifted as soon as the top growth begins to wither which is usually after the first light frost. 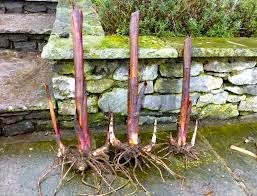 Carefully lift them out of the ground (trying to keep the root system as intact and 'undisturbed' as possible) and allow the plants to partially dry off in the late autumn sun. If rain is forecast then bring them under cover. Before the plants become too dry, cut off the leaves and roots in readiness for storing through the winter. 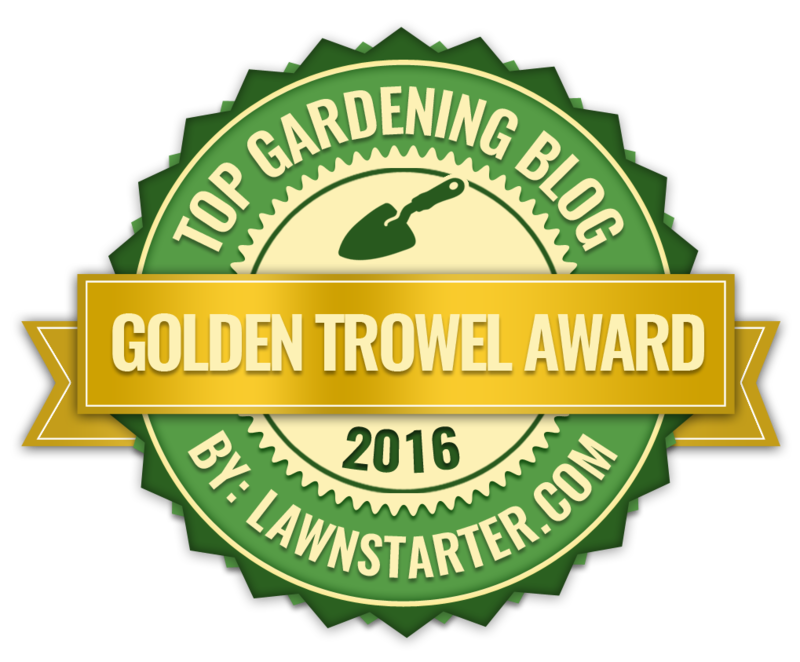 Plant up the rooted stems in moist, but not wet, peat or leaf mold in a frost-free position. If kept too dry the rhizomes will shrivel up and die, but keep them too wet and they will be at risk of rotting off during to fungal infections. Overwintered canna lilies can be planted back outside in late spring once the threat of late frosts have passed. NOTE. If you know that you will be lifting your canna lilies at the time of purchase then consider planting into large terracotta pots beforehand and sinking those into the ground. This makes lifting them later on on the season a much simpler operation.